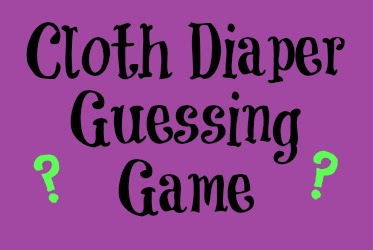 Cloth Diaper Revival: Cloth Diaper Guessing Game! If you received a box of random cloth diaper items from different friends would you know what each item was and what it was for? I received an email full of images from my friend Joann. Her friend Michelle is new to cloth diapering and received all of the below items from various friends. She emailed Joann the images looking for explanations of each item. It sounded like a fun challenge! I haven't seen any of the items in person and neither has Joann. We only have the images and a few notes to help us figure it out! I've only been cloth diapering for just over a year. Some of these items are from before my time. These are definitely bumGenius diapers in hook and loop! They appear to be pocket diapers. Since they are sized diapers, I know for sure they are not the current 4.0 diapers on the market. The colors from left to right are butternut, blossom, grasshopper, bubble, and zinnia. These diapers should have come with some microfiber inserts that stuff into the pocket opening at the back of the diaper. If not, you will need to purchase some or use something else inside the diaper to absorb the wetness. UPDATE! Thanks to Karyn, these are bumGenius 3.0 Deluxe diapers! They are all-in-one diapers with a pocket opening to adjust the absorbency if needed. You can use these diapers as is or stuff a doubler inside to icrease the amount the diaper absorbs. For details on sizing and more info, see this website. How to use it: Fasten onto baby like you would a disposable diaper using the velcro tabs to close. 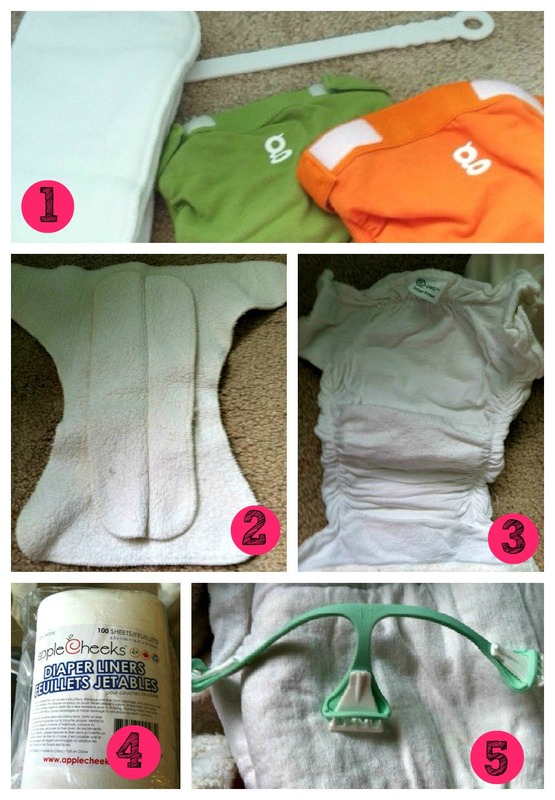 After each use, attach the velcro tabs to the laundry tabs on the inside of the diaper. These prevent the diapers from sticking to one another in the wash. I thought these may be discontinued bumGenius 3.0 diapers. However, from the research I've done, 3.0s were offered as either one-sized pocket diapers with snap down rises or as sized (small, medium, and large) all-in-ones. Since these appear to be pockets, they don't match either of those descriptions! Since I started cloth diapering, 4.0s have been the only pocket style available from bumGenius. I wonder if these are 2.0 diapers. Anyone know? Bummis Super Whisper Wraps- These are diaper covers, also referred to as wraps. You use them as waterproof barriers over an absorbent diaper (fitted diapers, flat diapers, prefolds or a soaker). According to the tag, these are Bummis Super Whisper Wraps in newborn size. They will fit from 7-10 pounds. You can not use these alone! There needs to be something inside the cover to absorb the urine. How to use it: First you must lay an insert inside or put a prefold, flat, or fitted diaper on your baby. Then place the cover over top like you would a disposable diaper, securing the snaps or velcro. You can reuse the wrap in between diaper changes. Just wipe the inside clean. 1. gDiapers- This is 2 gPants diaper covers in guppy green and great orange. To the left looks like gCloth inserts. The inserts are sized, so I'm not sure what size are shown here. Perhaps there's a tag on them. The white wand is a swish stick. It's used to help flush the biodegradable gRefills (inserts). gDiapers are considered a hybrid diaper. How to use it: Lay an insert inside the cover. You can use either a cloth insert or a disposable insert inside the cover. The velcro attaches at the back of the diaper. You can reuse the covers in between diaper changes. Just wipe the inside clean. You can also use this cover with any type of insert, not just the ones made by gDiaper. 2. Fitted (Contoured) Diaper- I'm unsure what brand this is, but it is definitely a fitted diaper! It looks to be sized, but your guess is as good as mine! The fabric appears to be made of hemp or possibly cotton, maybe a blend. You would need to use a diaper cover over this when using it to make it waterproof. The smaller piece of fabric inside is an extra layer of absorbency. The diaper would need be fastened with a Snappi (keep reading) or diaper pins. How to use it: Lay your baby on top of the diaper. Pull up the front (like a disposable) and pull the side tabs around the baby's waist. Secure with a Snappi or diaper pins. 3. Green Mountain Diapers infant fitted - This diaper is made from 100% cotton and fits a baby 5-13 pounds. I can't tell from the picture, but this diaper closes with either snaps or velcro. So no use for pins or a Snappi (keep reading). This diaper does require a diaper cover. How to use it: Lay your baby on top of the diaper. Pull up the front (like a disposable) and pull the side tabs around the baby's waist. Secure it with the velcro tabs. When soiled, secure the velcro to the laundry tabs on the side of the wings. 4. AppleCheeks liners - These liners lay inside the diaper to catch the poop! Once soiled, just flush them down the toilet. If the baby doesn't poop between changes, you can rinse, hang to dry, and reuse. These are not needed if exclusively breast feeding because breast milk poop is water soluble. Please note, that the diaper cannot be reused when using a liner. The liner does not stop the liquid from absorbing into the diaper, just the solids! An alternative to using liners would be to use a diaper sprayer. You can read more about poop and cloth diapers here. How to use it: Lay on top of your diaper in between the baby and the diaper. When soiled, just slide the liner into the toilet and flush! 5. Snappi diaper fastner - This is used to fasten diapers (fitteds, prefolds, flats) instead of the old school method of diaper pins. The Snappi has teeth that grip the diaper and hold it closed. The loops around the teeth can be pulled back and away to expose the teeth for use. When not using the Snappi, hook the loops back over the teeth to protect from scratches. The teeth can be pretty sharp! Snappis come in two sizes, size 1 and 2. I'm unsure what size you have. You can check out my review and directions on how to use a Snappi here. How to use it: See the Snappi website for a diagram showing how to use it! Have you used any of the products above? Anything you would like to add? Comment below to share your cloth diaper knowledge! Do you have a cloth diapering item you are unsure of? Email me a picture and I'll do my best to help you out! Oh my goodness! This is amazing! Thank you so much to you and Joann for this post! I certainly have a "grab bag" of diapers here! Pictures 2, 4, 5 came in the same box along with the Whisper wraps. Can you use the whisperwrap over the number two diaper? Yes! Lay 4 (a liner) inside 2 (contoured fitted), close with 5 (Snappi) and then use the whisper wrap over all of that! So glad it helped! I'll let you know if I get any more info on the Bumgenius diapers at the top! I emailed an expert, just waiting for a response! I believe that the BumGenius are the 3.0 Deluxe. They were a sized or OS AIO with a pocket opening to add additional inserts (along with the one that was already sewn in) if desired. I am not sure about the colors. On my computer, the ones that you referred to as blossom actually look purple, where blossom is a pale pink. I think that they might actually be "bubble" which was a very pale (almost white) purple. Karyn, Thank you!!! I think you are right about the 3.0 deluxe! The contoured diaper looks like Kissaluvs contoured diapers.